Chancellor Blumenthal has signed the UC Santa Cruz Real Food Campus Commitment, recognizing the campus's efforts in achieving greater real food procurement on campus. The signing, which took place on February 17, also commits UCSC to meet or exceed 40 percent of real food purchases in dining services by 2020. The event — in the College 9/10 Multipurpose Room — began with a "Taste of Santa Cruz" fair, which featured over 20 local food producers and growers as well as non-profit partners in sustainable agriculture and food systems from the greater Monterey Bay region. At the same time, the "Green Chef" competition featured student teams which prepared a dish with this year’s secret main ingredient: carrots. The signing ceremony began with a welcome by Tim Galarneau, from the Center for Agroecology and Sustainable Food Systems, and an introduction of the commitment by Alexandra Villegas, CUIP Sustainability Intern with UCSC Dining Services. “Real food, as defined by the Real Food Challenge, is food that is produced in a fair, humane, and sustainable manner,” said Villegas, describing the meaning of the UC Santa Cruz Real Food Campus Commitment. Other speakers included Andrew Whitman, CUIP of the Food Systems Working Group; Patricia Allen, executive director of the Center for Agroecology and Sustainable Food Systems; representatives of the Student Union Assembly, Jessica Greenstreet and Brittany Smith; and Chancellor Blumenthal. Blumenthal expressed appreciation for the student empowerment of campus organizations such as the Food Systems Working Group and PICA, as well as commended the dining operation and scholarly research that, together, have made UCSC a leader in sustainability. 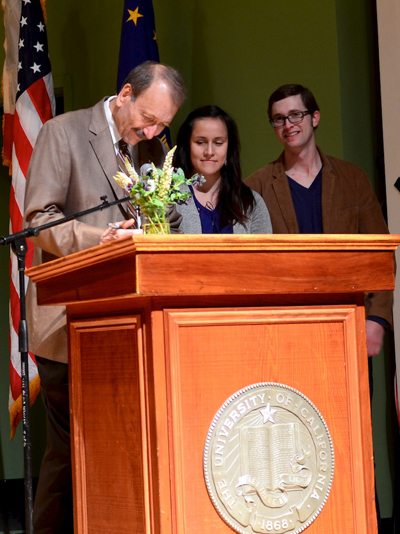 Following the chancellor’s closing remarks was the official signing of the commitment. Assistant Dining Director Bill Prime stood in for Scott Berlin, director of Dining Services, who was unable to attend; Berlin signed the commitment in advance. Dining Services has been a long-term supporter of many campus sustainability initiatives and was a collaborator with the Food Systems Working Group in construction of the commitment since its initial discussions in December 2011. Prior to the commitment signing, UC Santa Cruz’s campus goal in real food procurement was 20 percent by 2020, as mandated by the UCOP Sustainability Practices Policy. Currently, Dining Services is operating at a 28 percent real-food level. The food procurement is calculated through the Real Food Challenge's Real Food Calculator as well as STARS (Sustainability Tracking, Assessment & Rating System). Through the Real Food Challenge, students across the nation are using the real food calculator and metric system in collaboration with their campus dining services operations to measure the amount of real food served on their campus. UC Santa Cruz Dining and the Food Systems Working Group will continue its current collaborative efforts in engaging students in real food initiatives on campus, increasing transparency of our food procurement, and working towards achieving UCSC's new commitment to increasing the amount of real food on campus. Visit their web sites to learn more about UC Santa Cruz Dining, the Center for Agroecology and Sustainable Food Systems, and the Real Food Challenge.